This is a guest post by Jonathan Pflegl. Jonathan is a 21 -year- old student at Regent University, majoring in communications with an emphasis in journalism. Originally from upstate New York, Jonathan is pursuing a career in sports journalism, and he currently writes for an online magazine, his school newspaper, The Daily Runner, and his own sports blog. He regularly updates his social media accounts, such as Facebook, Twitter, Tumblr and Instagram with sports highlights and other interesting facts from the sporting world. He enjoys watching sports, writing sports articles, acting, playing drums, taking pictures, and hanging out with friends. 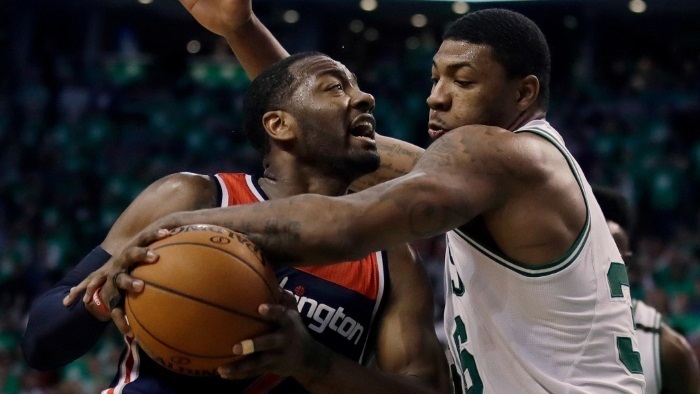 The other night, in game 7 of the 2017 NBA Eastern Conference semifinal playoff series, the Washington Wizards, led by superstar guards John Wall and Bradley Beal, came into TD Garden in Boston, Massachusetts, feeling great about themselves facing the Celtics: Two nights ago, in game 6, Wall hit the game-winning three-point jump shot to stave off elimination and keep their hopes alive of advancing to their first conference finals since 1979. After forty-eight minutes, Washington left Boston in usual Washington, D.C. sports fashion: failure and disappointment. But last night was not the only time a Washington, D.C. pro sports team came up short in the postseason: A few weeks ago, in the 2017 NHL playoffs, the Capitals were shut out by the Pittsburgh Penguins 2-0. The offense, led by Alex Ovechkin, couldn’t muster anything against Pittsburgh goaltender Marc-Andre Fleury, losing to the Pens for the second straight postseason. Since drafting Ovechkin, Washington has yet to advance to the conference finals. In Major League Baseball, the Nationals have yet to advance to the National League Championship Series and the World Series. This is a sad trend for the fans living in our nation’s capital. What is going on here? Could it be that the city is cursed? Is it underachievement? What could the problem be? Talent is not a problem. All four professional sports franchises dwelling in Washington, D.C. have drafted future hall of fame players in recent memory (Wall, Ovechkin, Bryce Harper), but so far, these talents have been wasted when it matters the most. Could the coaching or the front office executives be the culprit? With the lone exception being the Redskins, the answer would be no. The general managers for the Nationals, Wizards, and Capitals all have signed free agents and drafted players who, in their minds, would be vital to the success of their teams. For instance, this past offseason the Nats signed free-agent catcher Matt Wieters, formerly of the rival Baltimore Orioles, to solidify their need for a backstop. Washington, D.C. is having a challenging time building up a successful, winning sports culture. Its continual playoff frustrations shouldn’t have anything to do with politics. Whatever the case may be, something must give for the long suffering fanbase of that region of the country. Will the fortunes of Washington, D.C. pro sports turn around for good? Only time will tell.